Concrete has gotten a bad rap, associated in most people’s minds with dreary gray “concrete jungles.” But wait! If you take a second look at today’s concrete, you’ll be surprised how much it has improved over the years. It’s not your grandpa’s concrete anymore. In fact, it’s the perfect material for upscale patio construction. Read these 11 reasons why we love modern concrete patios and you’ll become just as passionate as we are. Style. Yep, you heard right. Forget the dingy gray backyard slab of yesteryear. 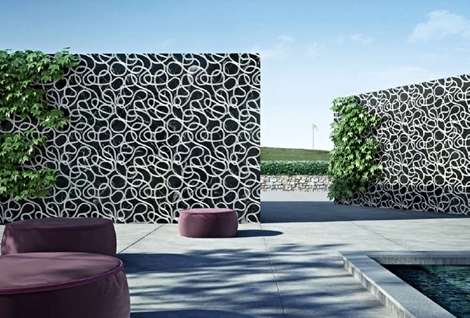 Today’s stylish modern concrete patios sure ain’t what they used to be … not when you’ve got an incredible range of ways to add excitement. Think concrete that is stamped, stenciled, or engraved; faux wood, brick, or stone look; or amazing aggregates like colorful crushed glass. Extra living space. Want more room to stretch out, entertain guests, and just plain live? 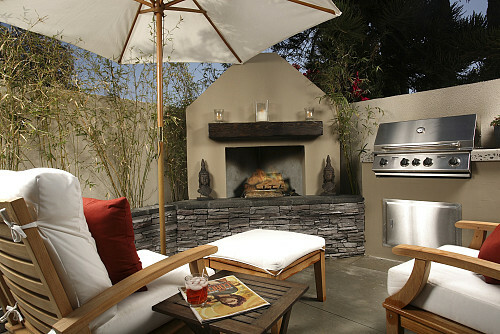 Installing a patio gives you more space to enjoy without adding to the footprint of your home. And even when you live in a northern climate, it can be usable most of the year -- simply add a canopy or roof, weather resistant carpeting, and an outdoor propane heater. Easy care. 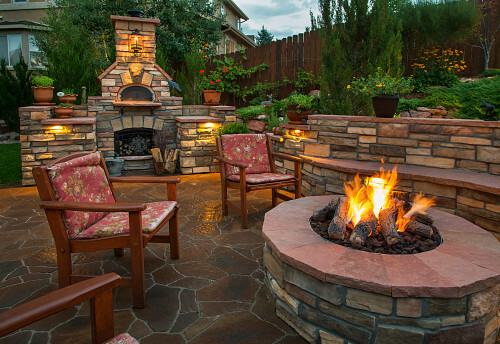 How do you keep your patio looking terrific? Simply sweep the concrete clean and occasionally sluice it down with your garden hose. Solid-surface concrete won’t harbor mold, insect pests, or weed growth. Just apply a coat of sealant every other year to maintain its good looks long term. Durability. Your concrete patio will be gorgeous and functional for years to come; it won’t ever rot, warp, or sink, and is completely fireproof. You only need to make sure the patio installation includes good drainage and reinforcement, proper curing, and control joints to prevent random cracking. Surprising eco-friendliness. 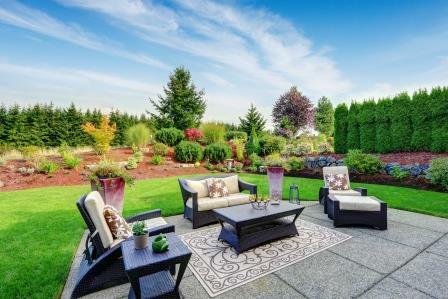 Installing a concrete patio has a surprisingly low environmental footprint when you utilize concrete that's locally produced (to avoid long distance transport), using recycled materials, such as metal fibers or demoed concrete. Flexibility. Feel free to position a patio anywhere in your yard you choose. Catch the sun’s rays with a southern exposure or opt for a shadier spot. 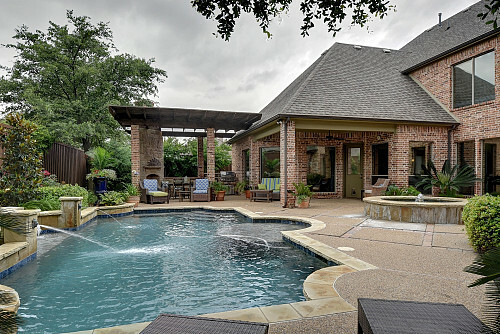 Design your patio in any shape that strikes your fancy – curve the edges, allow open spaces for trees or smaller plants, or wrap around a pool or other feature. Unified look. Install a practical, decorative concrete walkway at the same time your patio is being poured for a very classy, unified look to your property. Ditto for other hardscaping like retaining walls or built-in concrete benches and chairs. Color the concrete to complement your house or the surrounding landscape. Sturdy support. Your modern concrete patio will form the perfect strong and solid base for (literally) tons of fun features. Think a full set of patio furniture, fire pit, planter boxes, pizza oven, spa tub, or even an entire outdoor kitchen or living room. Fast install. You’ll only need to allow a few hours for your concrete patio to be poured. After a day or two, walking on the fresh surface will be fine. Just be sure to wait one full week before you move heavy lawn chairs and the like onto your new patio. Affordability.Your basic concrete patio cost is approximately $6-$10 per square foot for materials and labor; for a customized version, cost to install a concrete patio will rise to $10-$15 per square foot or more, depending on how complex a design you select. Contact a concrete pro for a detailed estimate.